Renowned Cuban composer Ernesto Lecuona (1895-1963) wrote La Comparsa and ...Y La Negra Bailaba! as part of the Danzas Afro-Cubanas suite. La Comparsa takes me back to my childhood in Baracoa, watching the Carnival parade from my grandmother’s house, looking through a majestic arched window. I clearly remember the spectacle: the overwhelmingly muggy heat, the animated people dancing, their sensuous hip movements, the gradual approach of the procession, its electrifying vibrations as it neared and how it steadily faded away into the distance. ...Y La Negra Bailaba! is a delightful piece which cleverly captures the image of a black woman dancing to the syncopated rhythms of Afro-Cuban percussion. From the vibrant sounds of tropical Cuba, we move to the more orderly and restrained world of Spain in the 1700’s. Spanish Baroque composer Antonio Soler (1729-1783) is highly regarded for his keyboard sonatas, originally written for the harpsichord, which he imbued with clarity, simplicity and finesse. Here I present two of my favorites. Cuban composer Ignacio Cervantes (1847-1905) wrote 41 Danzas for piano, characterized by their brevity and concise harmonic design, yet whimsical eloquence and fervor. Despite being greatly influenced by the romanticism, elegance and cultural abundance of 19th Century Paris, where he lived from 1865 to 1870, his Cuban originality and Latin American rhythmic flavor always shine through. The popularity of Cervantes’ haunting melodies persists today. Spanish composer Isaac Albéniz (1860-1909) wrote some of the most technically demanding works in the entire piano repertoire. These three pieces comprise the first book of his Suite Iberia, which were premiered in 1906. Evocación is an impressionistic song without words, evoking magical moods developed with great subtlety and nostalgia. El Puerto (The Harbor) is a highly stylized dance-like portrait of the picturesque fishing-port town of Santa María on the Bay of Cádiz utilizing characteristic Andalusian melodic ornamentation and lively Zapateado rhythms. Corpus Christi en Sevilla portrays the Corpus Christi Day procession in Sevilla through motivic development of the Spanish folk song La Tarara in various permutations, symbolizing the thrill and chaos of the crowd. After a cacophonous climax, the piece ends with a peaceful coda, which to me feels like a devotional prayer. Argentine composer Alberto Ginastera (1916-1983) artfully captures the spirit of his native land in his three Danzas Argentinas, Op. 2 with innovative polytonality, rhythmic vitality, dramatic use of dissonance and melodic lyricism. Danza del Viejo Boyero (Dance of the Old Herdsman) is a boisterous depiction of an elderly herdsman, set in miniature. Danza de la Moza Donosa (Dance of the Beautiful Maiden) is a highly evocative musical meditation with shades of complexity that perfectly express the many moods of a woman. Danza del Gaucho Matrero (Dance of the Cunning Cowboy) is a ferocious romp through the Pampas Argentinas filled with brutal physicality and raw excitement. Malagueña is perhaps Ernesto Lecuona’s most famous and beloved work, which has been performed and arranged for all kinds of ensembles and soloists in various musical genres. This rendition, the sixth movement of Lecuona’s Suite Andalucía, is the original piano version. It is remarkable how Lecuona so thoroughly understood and distilled the heart, soul and “pasión” of España in this composition. 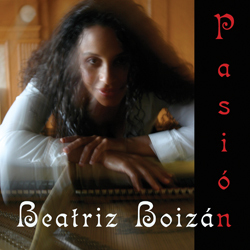 Beatriz Boizán embodies the heart and spirit of Latin piano. 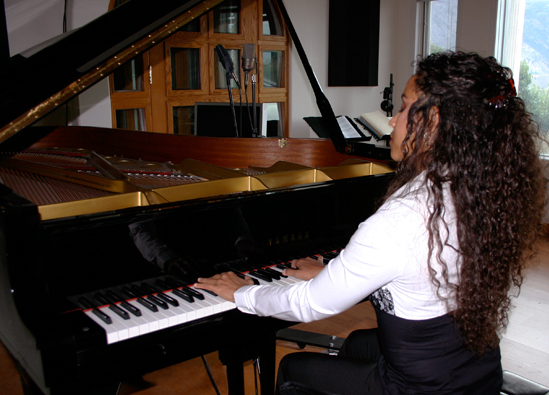 From her native roots in Baracoa and Santiago de Cuba to her present home in Canada, her unique interpretations of Spanish and Latin American compositions exude poetry, poise, passion, infectious rhythm, subtle pastel nuances, and a hint of mystery. This mixed with fire and a deeply rooted pride in her Latin heritage combine to make her the brilliant artist she is. It's an honor to produce her debut CD. Plugins used: Masterworks EQ, Masterworks Limiter, Altiverb.